This week has been such a long one, juggling my dissertation, work, blogging and sorting my life out, ha! I've spent the weekend relaxing and sorting the house out. I literally cannot function when my surroundings are cluttered and messy. I was sent these gorgeous boots from Public Desire to try out and style. I am in love with them and I really cannot put them away. They are inspired by the Dior shoes from a few collections ago. I decided to style them more casually here with jeans, as I feel it compliments the material of the shoes. I also think that wearing them with white jeans make them more day time appropriate. What do you think? Let me know if you want to see how I'd style them for a evening/night out! LOOL! Tell me that's not the sweetest cat! I am also in the process of getting my YT channel back up and running (already have a video filmed and half edited) so make sure you stay tuned for that! 1) Those shoes are amazing. 2)That bag is adorable. 3) So is the cat. 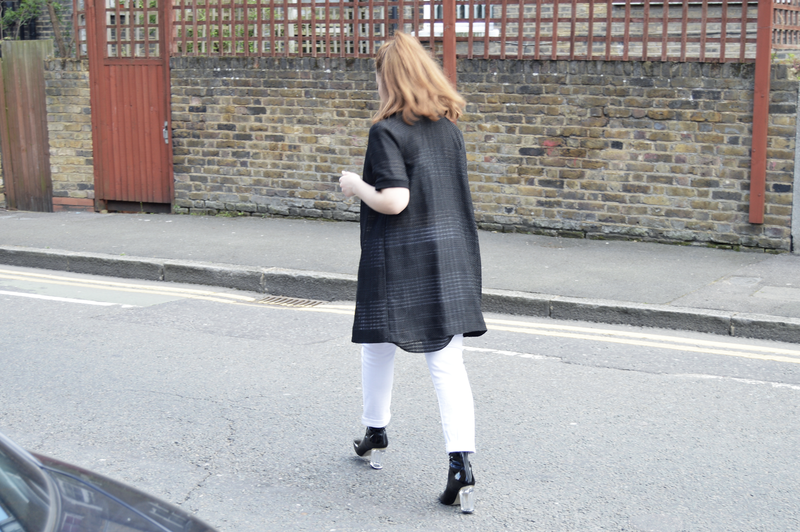 Love a good monochrome outfit. Suits you perfectly. Come through girl!! So much love for that short-sleeved jacket + insane transparent heel. And that top knot action... Yes and yes!